An engraving by C. Bailey, one of several in the "Ladies Manual", which dates from after 1871. The building on the right was the original hydro building of 1851, bought by John Smedley in 1853. Black's Guide of 1864 recorded that: "At Matlock Bank, a rapidly increasing locality, is Mr. Smedley's hydropathic establishment, one of the largest and best conducted establishments of its kind in the kingdom. It is capable of accommodating some hundreds of patients, and no greater proof of its excellence can be adduced than to say it is always being enlarged". A Leicestershire newspaper was to comment in 1874 that Smedleys rather resembled a barracks, though othing was said about the treatments the patients were receiving. 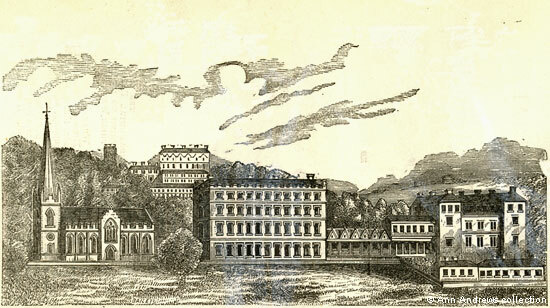 In 1875 it was announced that "THIS ESTABLISHMENT ia passing into the hands of a Company, and will be carried on in all essentials as it has been in the past ... many improvements have been and are in the course of being carried out, and will include a commodious TURKISH BATH and Electric Bells throughout the whole building". The Chairman of the Hydropathic Company noted at the annual meeting in 1877 that the Turkish Bath had been in use for nine months and the visitors approved if it "on account of its unique ventilation arrangements and capacious apartments". As the hydro expanded from its modest beginnings more and more small parcels of land had been bought from the its neighbours. The engraving shows us the hydro before any of the major works that were undertaken from the 1880s until 1894 to transform the hydro into the much more recognisable building that exists today. This book is in the collection of, the information is provided by and images scanned and repaired by and © Ann Andrews. "Leicester Chronicle", 1 August 1874. "Derbyshire Times", 28 July 1875. "Derbyshire Courier", 15 September 1877.